We returned to Playa Gigante, Nicaragua in December, this time with our kids, to help out two local non-profits that are doing a lot to keep this part of the world beautiful and the locals healthy and economically self-sufficient: Sweet Water Fund and Project WOO. We also came to enjoy the still pristine tropical beaches with world-class surf breaks and the see the native flora and fauna. The native fauna include flocks colorful squawking parrots and at least one troop of wild mantled howler monkeys who live in the tree canopy above the town. We ended up doing all those things. We started by helping the Sweet Water Fund's project supporting the local women's softball team, Las Estrellas de Gigante. 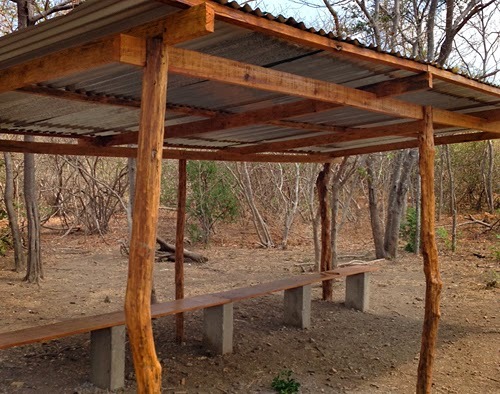 We purchased building materials needed for their field's dugouts and trucked them back to Playa Gigante. For me, going out and purchasing building supplies in Spanish (I'm not even close to fluent), without a car, in a city an hour away that I've never been to, and on New Years Eve was an interesting challenge. New Years is a big holiday in Nicaragua that is noteworthy for its exuberant revelry, effigies of "Año Viejo, and fireworks. This "mission impossible" was made possible through the loan of Dale Dagger Surf Lodge's ancient-but-indestructable-4x4 truck and its Spanish-speaking American expat/local surf tour guide/dirt road commando and Sweet Water Fund volunteer Shawn. 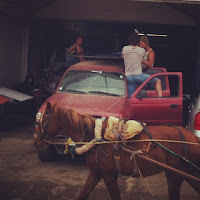 He got us thru the crowded (with venders, ox carts, goats, chickens, children, family motorbikes) streets of downtown Rivas to a friendly Spanish-speaking building materials shop called Ferromax. With his guidance, and our son's help translating, we were able to get the building materials we needed for the softball field. Playa Gigante is going through profound social and economic changes right now as it transitions from a small fishing village accessible only by a dirt road into an international surf and tourist destination. Its local families, who for generations have relied only on fishing, farming and each other to live, will need all the help they can get to adapt to a new cash economy based on tourism. provided by KIRF in December 2012. Competitive sports have the ability to increase group solidarity while at the same time, increasing tolerance for diversity and an atmosphere of trust among its players and fans according to several recent studies in contexts of social change (Barrio 2009; Jarvie 2007; Jonsson 2001) As "hard cultural forms" competitive sports also teach their values of team work, personal accountability, achievement and leadership to players through its rules and particular sport culture (Appadurai 2010). KIRF has a history of supporting sports programs and physical education since our first donation of soccer balls to devastated communities in coastal Thailand after the Andaman Tsunami and our support of free athletics programs for street children and the rural poor in Bihar, India since 2006. 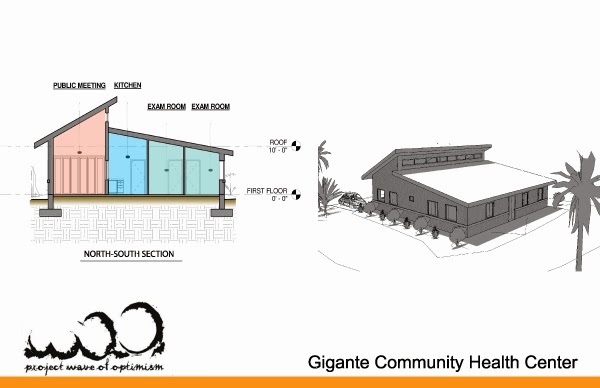 We aim to help out with the new Community Health Center working in partnership with the people of Playa Gigante and other non-profit organizations. KIRF has a dual mission of disaster relief and of helping people help themselves thru educational programs, which foster economic, health and environmental sustainability. In Playa Gigante, locally needed educational programs include physical education through their local women's softball team and health education at the new Community Health Center. Working with other non-profit organizations like the Rotary Club of Ventura, we feel that Playa Gigante has a chance to remain a beautiful and friendly place to visit as well as a great place to live for local "Nica" families. 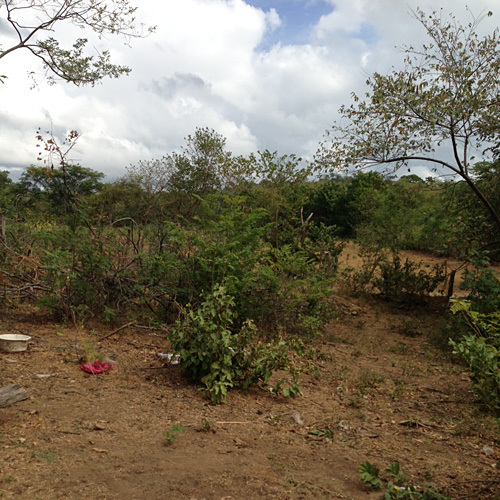 Part of our time in Playa Gigante was to work on behalf of the Rotary Club of Ventura to assess the location donated by a generous local landowner for the community well and for the future Gigante Community Health Center (GCHC). We came to the remote fishing village of Playa Gigante, accessible only via two dirt roads that meander to the coast from the main highway through verdant hills covered in rainforest and dotted with occasional small single-family farms and orchards wanting to experience for ourselves its natural beauty and help out two local non-profit organizations. We left wanting to help the people keep their town a great place to live. We hope that the people of Playa Gigante can keep their little town by the sea free of the cycle of poverty and hopelessness we saw plague some other communities in Nicaragua. In these places we saw street children begging, garbage in the streets and littering the hillsides, fouled streams, and young boys passed out from drug use. We also hope that in the years to come, Playa Gigante and the other picturesque towns along the Pacific coast, will remain a great place to live for it's plentiful wildlife as well. Colorful parrots, howler monkeys, sea turtles, spider monkeys, translucent-winged butterflies, all kinds of tropical sea life and other treasures call this part of the world home, too. It is my hope that with what we know now about environmental sustainability and social change, that we can keep little towns like Playa Gigante awesome. Appadurai, Arjun (2010) Modernity At Large, Minneapolis, MN: University of Minnesota Press, 90. Jarvie, Grant (2007) Sport, Social Change and the Public Intellectual," International Review for the Sociology of Sport, 42(4): 411-424.